If you are a "regular" blog reader you are probably familiar with Karen Azevedo. She is a very good friend of mine from Colorado, a long arm quilter, and a possessed Linen Lady as well! She is an amazing quilter and her work is in high demand. It seems she always has a stack of customer quilts waiting to be loaded onto her machine and time for "her stuff" is hard to come by. I used to quilt for other people and had the same problem. I found myself burning out and becoming resentful that everyone else got a chunk of my time but I never got any for me. I had lost my "balance". A friend recommended that I carve out a few moments here and there for ME...schedule it in if I had to...stick to that schedule....and it worked. I found myself enjoying my customer's quilts more and really looking forward to that block of time that had been reserved on my calendar for my stuff. I recommended the same thing to Karen and it is obviously working! 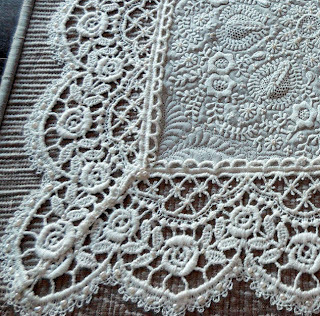 Karen purchased this beautiful delicate piece of hand embroidered fabric that was supposed to be the center of a baby bonnet. She purchased this off of Ebay and it was found in France and dated maybe early 1900's? 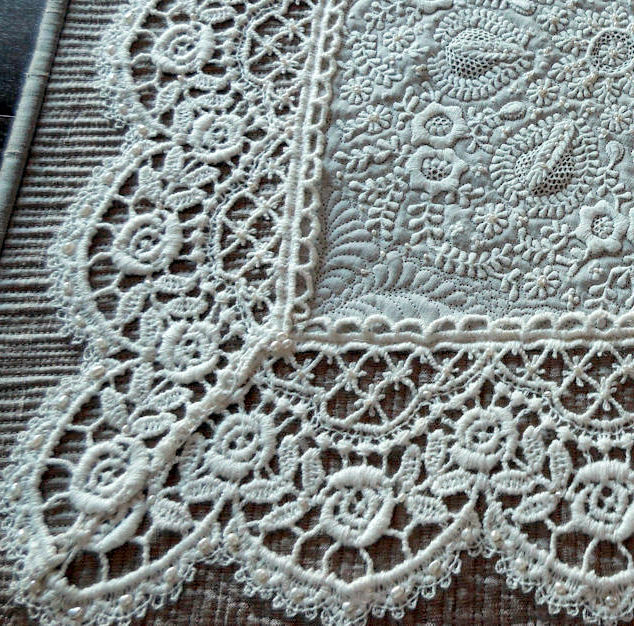 The border lace was from a curtain labeled "Made in Belgium". She placed the assembled piece on top of another fabric and then beautifully quilted it down. I'm blown away that she was able to ditch around the very tiny and delicate embroidery with her long arm...fabulous work. She is also an obsessed beader, as I am, and provided a photo of the sizes of the freshwater pearls she used to embellish the quilt with. Here is a copy of her label. Thank you Karen for continuing to inspire all of us. I think you are beautifully balanced! I know what you mean about getting resentful and burned out. That happened to me as well. Now that I am starting to quilt again, I made the decision NOT to do customer quilts unless it's something I choose to do for very specific former customers. And even then, they will be few and far between. It's so important we take time to be creative for US. Great post, Cindy and thank you for sharing Karen's lovely work. Karen's work is spectacular. Thanks for sharing her talent. Thank you all for your kind words. I'm slowly finding my "balance". It's always good to have more "me" fun in one's life.